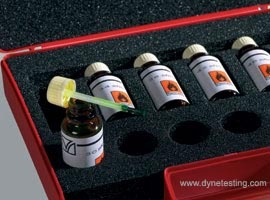 Dyne test inks and fluids (sometimes referred to as corona test fluids) are used for the quick and easy measurement of surface energy or wetting tension. This form of measurement is based on ISO8296 that describes the method for measuring the surface energy of polyethylene film. We have many customers in the UK & overseas who use our Dyne Test Fluids to test metal products for surface cleanliness and evaluating the characteristics of their products also. The surface energy of metals is much higher than that of most surface contaminants thus, the higher the Dyne level or surface energy (mN/m) also the cleaner the part is. To use the corona test fluids simply apply the Dyne test fluid to the material surface, the liquid will either form a continuous film on the surface or draw back into droplets. If the Dyne test ink remains as a film for 3 seconds or more then the material will have a minimum surface energy (Dyne level) in mN/m of that fluid value. Should the Dyne test liquid draw back into droplets in under 1 second then the surface energy (Dyne level) of the substrate is lower than that of the liquid value. The exact surface energy (Dyne level) can be determined by applying a range of increasing or decreasing values of Dyne test fluids. Supplied in 15ml bottles with integral brush applicator, containing: formamide, ethoxyethanol & dye, not suitable for use on soft PVC. 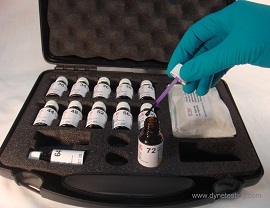 Type B Non-Toxic range of Ethanol based Dyne Test Inks. Supplied in 15ml bottles with integral brush applicator, containing: ethanol – not suitable for use on PP. Cotton Applicator Swabs Made to test method ISO 8296 for use with the Dyne test fluids. The cotton swabs have a 150mm long shaft to ensure your hand is kept well away from the test fluid and the substrate to be tested. The cotton applicator swabs are binder free and glue free which ensure the binder or glue cannot contaminate the test fluid or invalidate the test results. Ensure that no contamination is introduced into the Dyne test fluid from the surface being tested by using a single use cotton applicator swab . Small amounts of introduced contamination may lead to inaccurate and invalid Dyne level readings. If you are unsure which type of Dyne Test Fluid you need, please contact our Sales Team in the UK and we will help you select the right range of test solutions to suit your application. We also offer a full range of Dyne Pens. We offer a range of standard Dyne Test Kits containing 6 – 12 bottles and customers can also create their own kits choosing between the range of 23 – 70mN/m (minimum of 6 bottles apply). Please note we do not mix Type A and Type B test inks in our kits. Supplied in 15ml bottles with integral brush applicator, containing: formamide, ethoxyethanol & dye, not suitable for use on soft PVC. Available values: 23, 25, 27, 30, 32, 34, 36, 38, 40, 42, 44, 48, 52, 56 & 70mN/m (Dynes/cm). 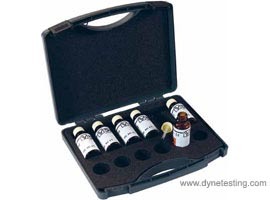 100ml bottles of the Type A Dyne Test Fluid are also available (min order of 4 bottles apply). Type B:- Ethanol based – (Non toxic): Supplied in 15ml bottles with integral brush applicator, containing: ethanol – not suitable for use on PP. Available values: 23, 25, 27, 30, 32, 34, 36, 38, 40, 42, 44, 48, 52, 56, 60 & 70mN/m (Dynes/cm). Made to test method ISO 8296 for use with the Dyne test fluids. The cotton swabs have a 150mm long shaft to ensure your hand is kept well away from the test fluid and the substrate to be tested. The cotton applicator swabs are binder free and glue free which ensure the binder or glue cannot contaminate the test fluid or invalidate the test results.